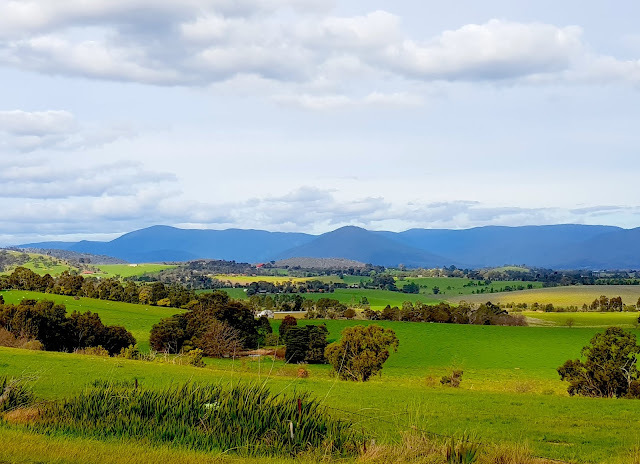 The Yarra Valley is renowned as one of Australia’s best and most beautiful wine regions, located one hour from Melbourne. Vast stretches of vineyard leave an imprint on the stunning landscape and against a backdrop of rolling hills and impressive mountains. The morning air is crisp at this time of year and the mist creates a pastel skyline, often adorned by hot air balloons. The Valley is a microcosm of Victoria’s best, bringing together fine food and wine, music, art and nature in one great location. It is an essential destination for food and wine connoisseurs and is the source of many culinary delights - magnificent cheeses, delicacies, fresh and organic produce, and artisan goods. The Yarra Valley is perfect for cool climate varietals. Pinot Noir and Chardonnay are amongst the many flagship wines. The region is linked by a number of towns and villages, and there are many wine routes to explore. 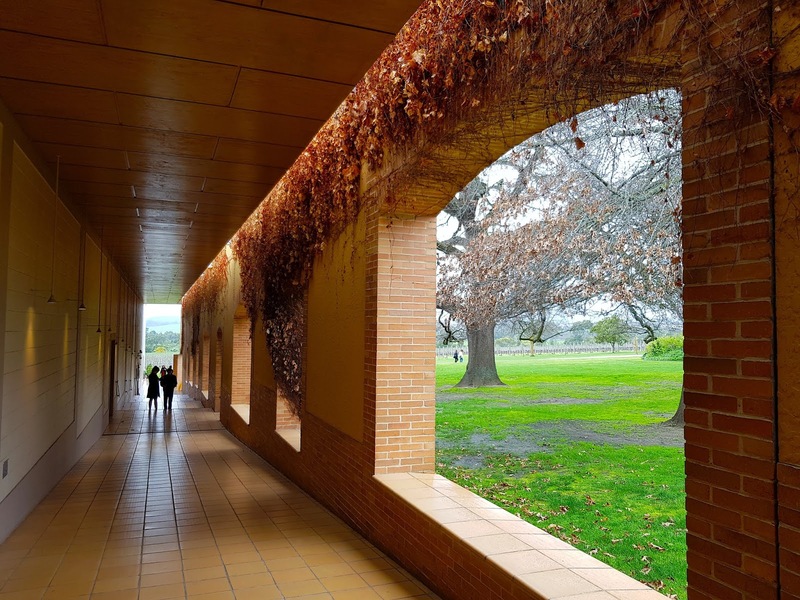 Two notable towns are Healesville (a weekend getaway favourite for Melburnians) with trendy stores, boutique fine food and wine shops, cafes and fashion; and Yarra Glen offering antiques, gift shops, and small cafes, plus the nearby chocolaterie. These towns, among others, are character filled locations en-route to an amazing variety of wineries – from large, notable standouts, such as Domaine Chandon, Yering Station, De Bortoli, Balgownie Estate, Rochford and Tarrawarra through to boutique growers and makers. The area brings together both old and new worlds of winemaking, with time-honoured traditional winemaking techniques meeting modern flair and innovation. 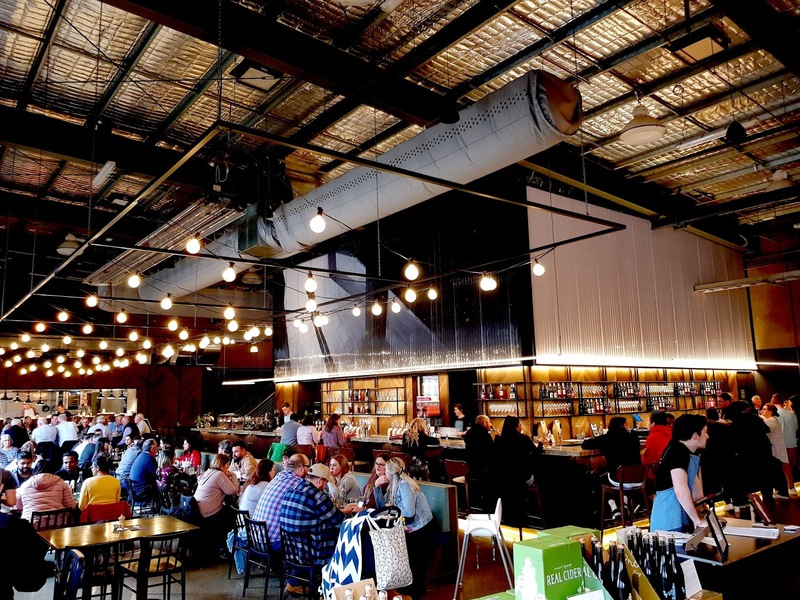 It is a delightful intersection that can be seen through the variety of boutique cellar doors, grand scale historic wineries and ultra-modern restaurants. 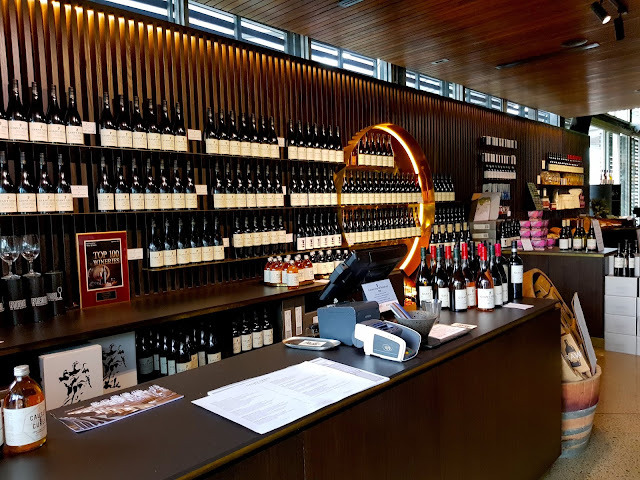 In Healesville, ‘Giant Steps’ and ‘Innocent Bystander’ make an impressive statement, standing tall and spacious in modern warehouse style form, attracting hundreds of visitors for lunch and wine. The wine is fantastic and the venues challenge the traditional approach – with a loud, lively, fun, trendy vibe. 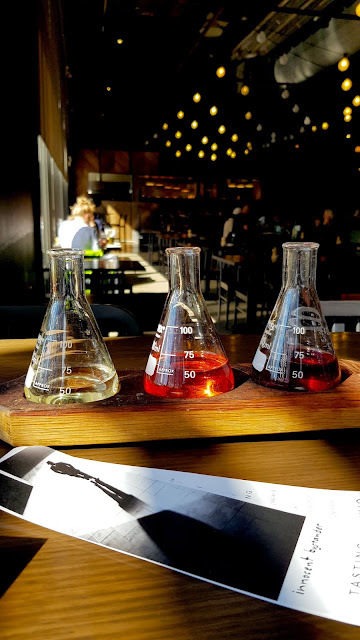 I experienced lunch at Innocent Bystander, purchasing a tasting paddle of three Yarra Valley wines, presented in flask beakers. I tried the 2017 Arneis, the 2017 Rose, and 2017 Pinot Noir. The Arneis was a light white wine – refreshing, dry and crisp with citrus. The Rose was made from Pinot Noir with strawberry and melon taste – light and crisp. The Pinot Noir was complex with cherry, pepper, oak and spice, and a smooth mouthfeel. The wine quality was great and the pinot noir was the most impressive of the three. The menu choices are ideal for lunch with friends, with shared plate options showcasing local gourmet favourites – such as whipped feta, duck and pistachio terrine, cured ham, bresaola, onion jam, baguette, and pickles. Delicious. 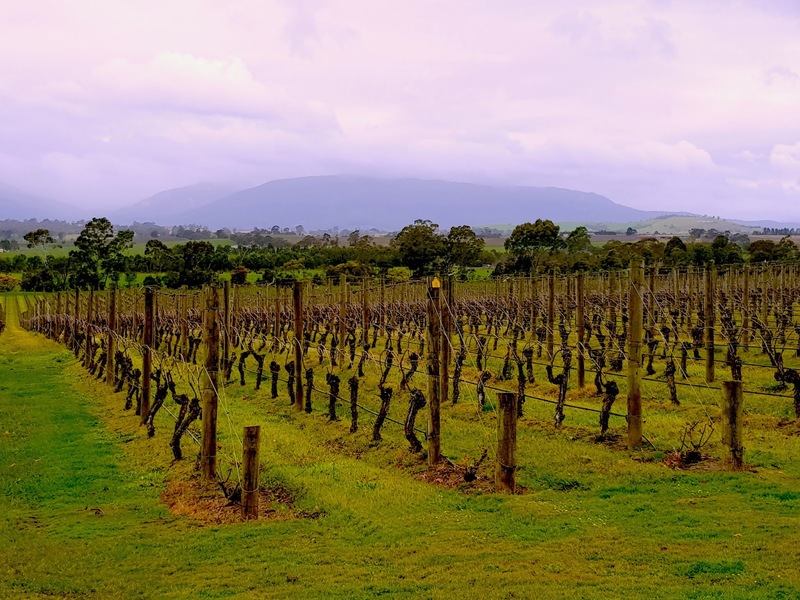 Aside from the modern approach, there is history extending more than 100 years in the Yarra Valley, with a number of well-established family owned wineries. 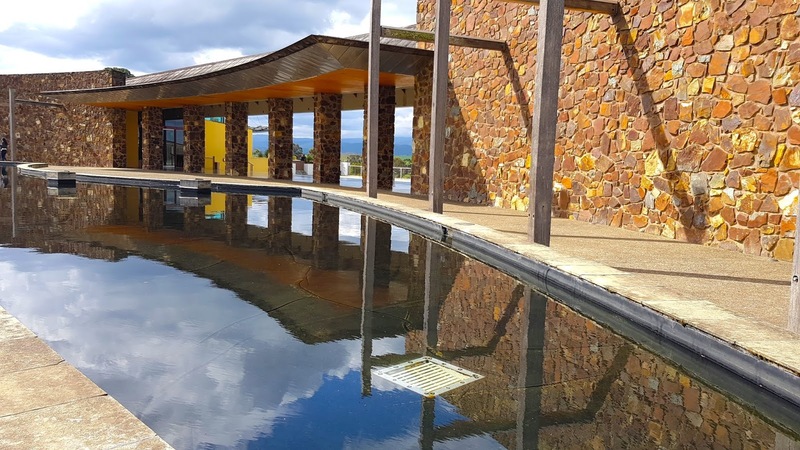 Yering Station has historic roots as well as stunning modern stone architecture, with fine dining, gardens and lawns, and vast views looking out into the magical Yarra Valley hills. It also has a cellar door and café with gift shop carrying local artisan treats. It also has accommodation and is home to the monthly gourmet farmers market in the barn. It is often sought after as a wedding or conference venue and helicopters frequent the site. Domaine Chandon offers picturesque views of the vineyards from the restaurant and grounds, with displays of the process of sparkling wine creation. The beautiful gardens and homestead make this an idyllic location for special occasions. Whether it’s a romantic long weekend getaway, a day tour, or a serious gourmet weekend, wedding or event – the Yarra Valley creates experiences to remember. The nearby attractions are countless, with enchanting forests, natural escapes, walks, trails, wildlife, farm experiences, and tours.